I’ve started a yearly tradition of closing out my year in a humbling way; by losing. What?! Yup. I’m a loser. In New York City I’m a well paid personal chef all year long, but I return home for the holidays to Southwest Missouri and there are two home cooks that outshine me in the kitchen. (And in a lot of other ways too!) Shaun Steele and Jason Shelfer, I salute you. Nobody likes losing, but coming home every Christmas and losing to these two gents (in a cooking competition, mind you) ends up being one of the highlights of my whole year. It's a simple equation....Good friends + Good food + A fun game = A great party, even if there's a loser. But throw in the bonus of raising funds for one of your favorite organizations and everyone comes out a winner! Last December I shared recipes and results from the S’macDown of 2016 - the macaroni and cheese cooking competition held over the holidays while I was home. To place votes, party guests sampled food 'entries' and voted with their dollars. (I lost then too!) Our event was so much fun and raised a sweet little sum for Art Feeds Carthage, the boys and I immediately starting planning the next cook-off. 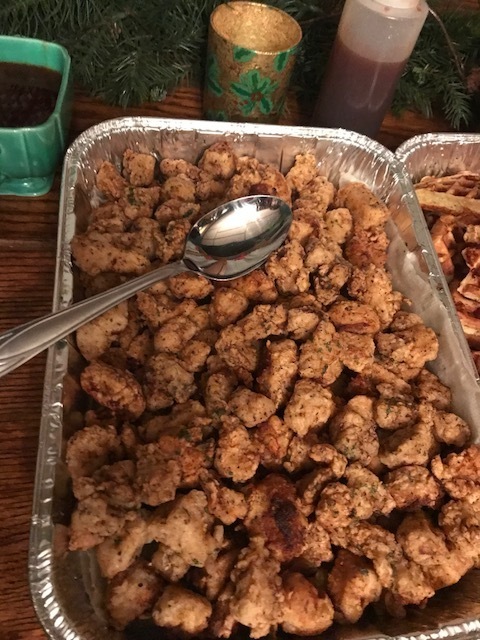 Jason was our second place chef - generously frying up five pounds of perfectly seasoned Chicken Fried Chicken Chunks. He had a Sriracha maple syrup as well as BBQ sauce. 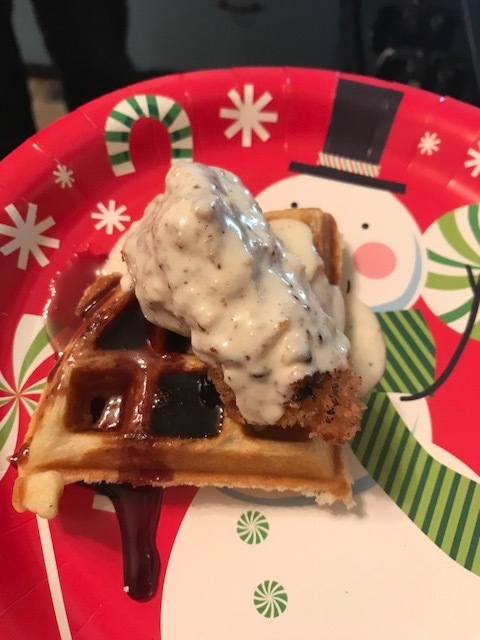 Jason is a Red Lobster alumnus so he paid tribute to the biscuits of his old stomping grounds with Garlic Cheddar Waffles AND some fun sweet Hong Kong bubble waffles with sprinkles and hazelnut spread! Do you know about these? Bubble waffles, they’re a real thing! My friends weren’t messing around, no wonder I lost! My entries were pretty tasty - I made Swedish style thin, lacy waffles and my chicken was a bit of a cheat. A delicious pro-tip cheat! If you can take a short cut in the kitchen with a readymade boxed or canned item - do it. And then put all your love, time, and energy into your homemade items. 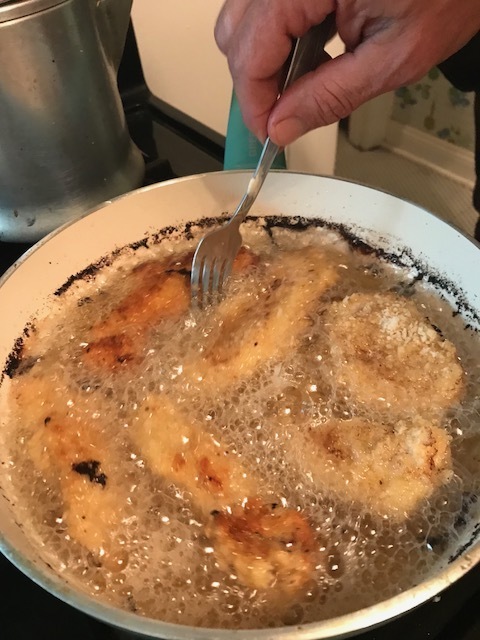 My culinary hero Sarah Simmons of NYC’s Birds and Bubbles and the underground supper club City Grit partnered with Williams Sonoma and made a fried chicken kit. I don’t think the kit is for sale right now, but Sarah was a guest on Rachael Ray and her magazine adapted the City Grit recipe. I may have lost the Great Waffle Off, but Sarah’s recipe is a knockout. So losing a cooking competition to these boys isn’t humbling at all, it’s an honor. I love them, their families, and our friends. Coming home to our sweet tradition is better than winning all the blue ribbons in the world. I’ve written about Art Feeds before, but here’s a recap below. Our little competition brought in $309 for this very important organization. You can donate HERE to add to our sum! Art Feeds believes all children are artists. They exist to feed creative development and facilitate emotional expression in children through art and community. To do this, they provide free therapeutic art and creative education programs within schools and children’s organizations by mobilizing teams of community members to bring all forms of art into classrooms. Shout out to Daniel Todd who didn't come to the party empty-handed. He roasted real pumpkin and scooped it out to make us these Pumpkin Waffle Fingers! Fluffy, seasonal, warming, and a delcious treat!